Ventnor Fringe Festival is Fabulous! As you should know we recently took a trip across the seas to spread our ukulele love with the good folk of the Isle of Wight. What a time we had! Ventnor Fringe Festival http://www.vfringe.co.uk/ is a 4 day celebration of the arts. The view from one of our gigs! And what a celebration it was. We busked our way across on the red funnel ferry for our fare and started the journey greeted with smiles, cheers and many children treating us as a mobile disco…so cute! 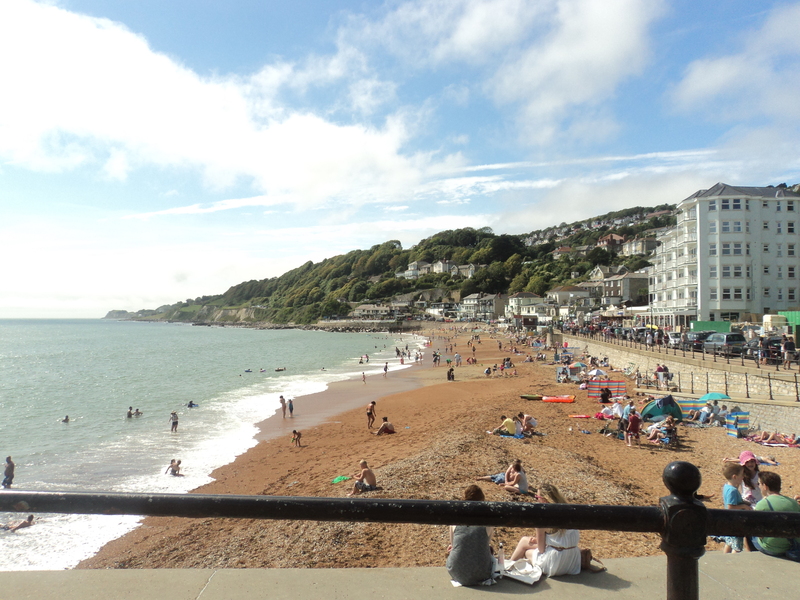 On arriving in Ventnor we found we had wangled residence in a gorgeous house with a lovely host family…we thought we had turned up at the wrong house when we saw the panoramic ocean views that greeted us! We really do land on our feet sometimes!! After exploring the quaint but HILLY town! 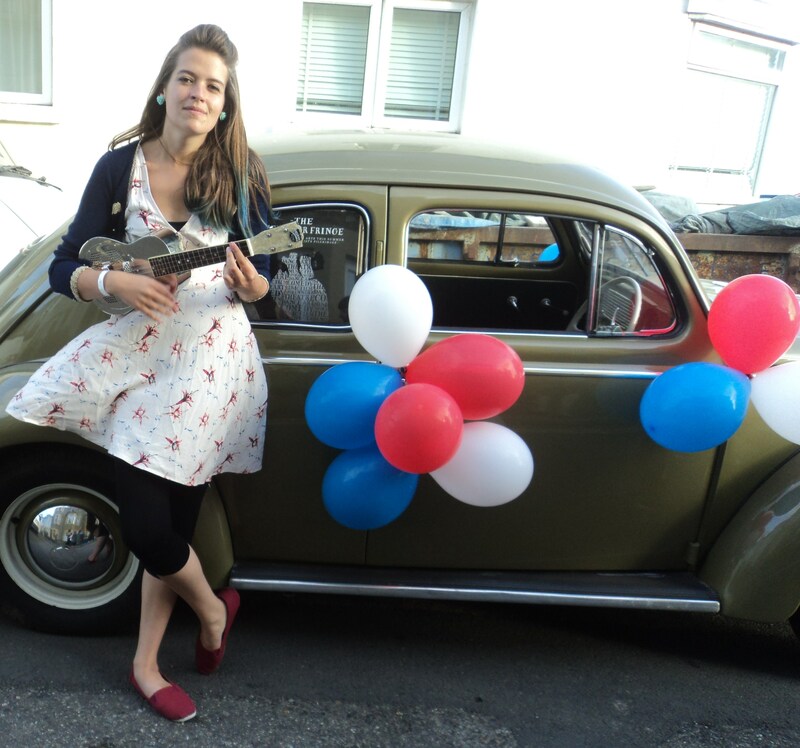 We joined the Ventnor Carnival to promote all of the upcoming excitement…Here is Lucy looking extra stylish as she cooly leans on a beautifully kept 56 year old bug that accompanied us through the procession! As well as playing a few well-received enjoyable busking spots and gigs we also got to be tourists, adventurers and festival appreciators! Attending the Secret Gig in an old disused bank with the bar set up in the Vault was a particular highlight, we especially enjoyed the harmony drenched, chilling vocal extravaganza that was C.H.A.M.P.S – check these guys out! The weekend was certainly not all work and no-play and after our crazy busking schedule over the Olympics we took a day off and explored almost the whole island! 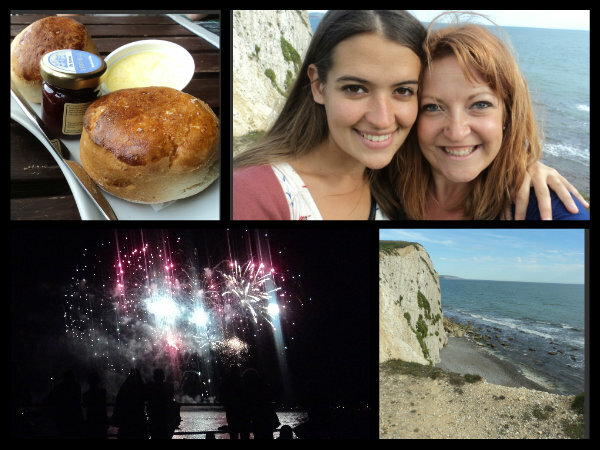 Taking in a cream tea on the Easterly tip, the fantastic views and craggy landscape of the West coast, a beasty pub dinner right in the centre and topped off with the Cowes Week fireworks with old friends….Spectacular and Spot On! On our final day at the festival we played a wonderful and windy gig at the Observatory bar. We saw some new faces, made some new fans and were chuffed to see people returning for a second experience of ‘Til There Was Uke tunes! 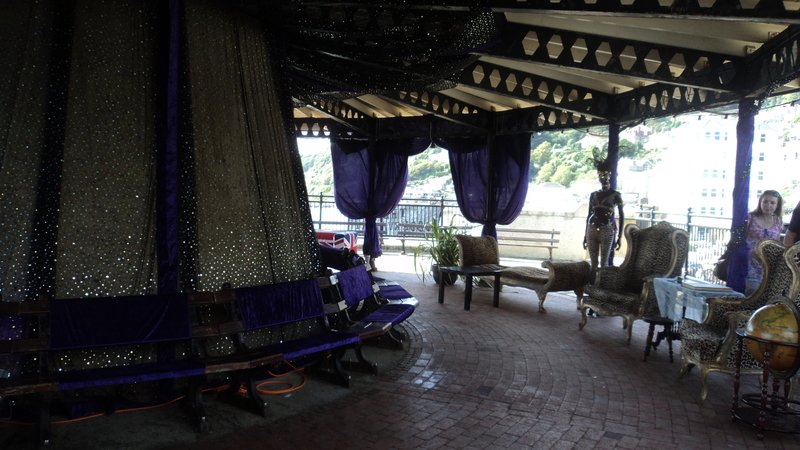 The Observatory bar is an old viewpoint/pier type construction that was overhauled and beautified using swathes of sequinned, purple material and leopard print chaise lounges just for the fringe, leaving a unique space and awesome venue to play in! This is literally a skimmed overview of the fun we had! We met some great people and a special shout goes to the amazing organisers!! They were always on hand for anything that we needed and just to share a smile, give encouragement and to see a familiar face! Love the lot of them! I would definitely recommend a trip to the island and if it coincides with the Vfringe then you are certainly in for a treat! Keep your eyes peeled for our video blog & just to forewarn you our trip lead to some song writing inspiration so that will be on it’s way shortly too! You’re no kidding about the hills. I know have calfs like a sherpa! Great to see you girls again and hope to see you again soon.